Steeple Aston potholes | Notes from the U.K.
People involved in British politics swear that politicians get elected (and unelected) mostly over potholes and garbage pickup, although it isn’t called garbage in Britain it’s called, um, something else. Not trash. And not dust, although the thing you put it in a dustbin, or a bin for short. Okay, I googled it: It’s called rubbish, which is also what you’d call a team someone else supports. Calling a team that is a great way to start a fight if you’re in a pub and it’s getting late and everyone’s well oiled. Just in case you need to know. But I’m off topic again, aren’t I? If, as someone famous once said, all politics are local, the residents of Steeple Aston in Oxfordshire are at the heart of political life. They’re worked up about their potholes. The council—that’s what you call local government, for those of you who need a translation—has been ducking the pothole issue, residents say, so in mid-May, after a rain had filled the potholes nicely, they floated a mass of rubber ducks on them. And called the BBC, which put some nifty photos online. I’m sure there’s a way to post them, but I have no idea what it is. You’ll just have to follow the link. 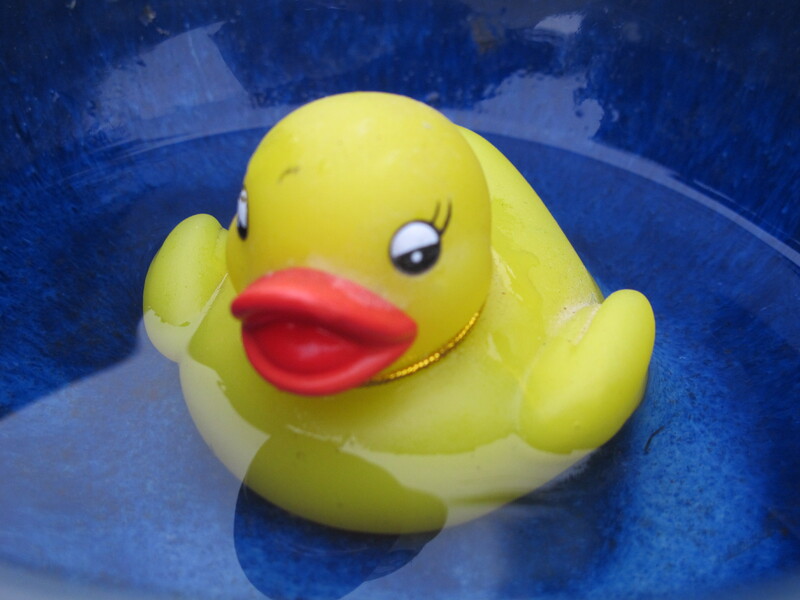 Relevant but fake photo: This is–as you may have figured out–a rubber duck. Or a plastic one but they’re called rubber ducks, so let’s not argue. We were getting on so well. The point is, it’s not in a pothole, it’s in a bowl in our back yard. The Poke calls it the most British protest ever. I’m not sure what makes it so British, although duck races are a big thing at fundraisers and village fetes around here. Fete, by the way, is pronounced fate. No, don’t ask me. I don’t understand it either. Besides, we’re talking about rubber ducks and it’s rude to interrupt. If it ever happens, I promise to post pictures, but I’m not sure a duckling and a cat are a good long-term combination. The BBC read through the county council’s website and quotes it as saying that any pothole the “depth of a coke can or the size of a dinner plate on a quiet carriageway” may need urgent attention. If the ducks haven’t gotten them filled by now, I suggest that the residents follow up with a picnic—Coke cans, dinner plates, and whatever Oxfordshire offers as a substitute for the Cornish pasty. You’ll find additional inspired ways to celebrate potholes in a second post on the Poke.